This week I have made some changes to my routine to get my head in line for the next few months. (Should I say rest of my life) I have joined the Anytime Gym in Farnham- and been three times. Yeah! There are some amazing people in this group who i follow and their yoga, walks, runs, gym session inspire me. 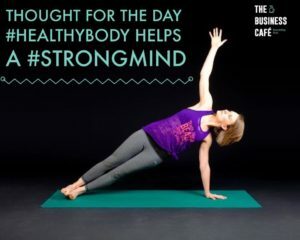 The relationship between the strength and stamina we have in our bodies are so directly related to our mind. Yet, when you are using your mind and body to its limit with work it is so hard to add yet another discipline and time stealer to your routine. The thought of the 90 min round trip added three times a week to my diary has taken me a while to accept. But I have to. And that is that. So today’s Thought for the Day isn’t about me passing on wisdom, this is an area of my life I am still to conquer and learn. And to the experts here that help people to become physically stronger, what are your tips for the rest of us. I have no doubt that a strong body helps to build a strong mind. For loads of reason- please inspire!